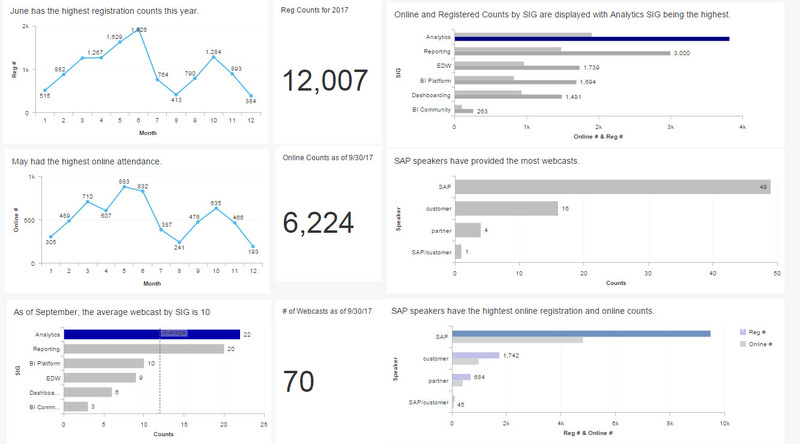 This year, the ASUG BI Community held 70 webcasts with over 12k of you registered. Thank you so much for your interest and attendance. See a complete list of replays. Our top webcast in both registration and attendance was Overview of SAP Lumira 2.x Road Map back in May. The top customer webcast was Ferrara Candy Company: How HR Learned and Created Dashboards Using SAP Lumira on SAP BusinessObjects Mobile and BI Platform. We are actively reviewing the annual survey results and the ASUG volunteers will meet in January to help plan webcasts for 2018. Thank you to all our speakers and our hard-working ASUG volunteer Special Interest Group chairs. Last May, we had thousands attend our sessions at 2017 ASUG Annual Conference. In August, Eventful Conferences, in conjunction with ASUG, held the BI + Analytics Conference, featuring keynotes from the Canadian Royal Navy, NHL, and more. In September, ASUG had over 80 hours of sessions at SAP TechEd Las Vegas. Planning is already underway for 2018 ASUG Annual Conference, held jointly with SAPPHIRE NOW, in Orlando, FL. Mark your calendars for June 5–7, 2018. The call for abstracts closed on Dec. 8, 2017. Our thanks to everyone who took time to submit. If you submitted an abstract, you should hear something by February. Registration for the event is now open. Be sure to mark your calendar for Monday, June 4, 2018, the ASUG Pre-Conference day at SAPPHIRE NOW and ASUG Annual Conference. It’s can’t-miss content! The BI + Analytics Conference will take place in Huntington Beach in less than two months, Feb. 19–21, 2018. This year, Eventful Conferences is producing the event. Be sure to check out the conference brochure. This conference is known for its hands-on sessions, and this year is no exception. There are hands-on sessions for SAP Predictive Analytics, SAP Lumira Designer and Discovery, and more. Last year, the sessions were completely full, with waiting lists. You can now view all of the conference speakers. 70 percent of the sessions are presented by customers, telling and sharing their stories. You can also check out the agenda or download the full schedule. Next year, SAP TechEd Las Vegas will be Oct. 1–5, and ASUG volunteers will be there. See what you missed at this year’s event. Many ASUG chapters have meetings planned for December. Check the calendar for meetings in your location, and take advantage of the free educational and networking opportunities.